Recent research on childhood difficulties with the acquisition of basic mathematical skills and successful interventions for children facing such challengesWe live in a world that requires us to process enormous amounts of numerical information as part of everyday activities such as operating technical devices, estimating or calculating financial gains or costs, and time management, to name just a few examples. A lack of numerical fluency can therefore strongly impact individuals' lives, work, health, and finances. One reason for low numeracy is developmental dyscalculia, a specific learning disorder that profoundly impairs the acquisition of basic arithmetic skills. Although the consequences of this are at least as detrimental as those of dyslexia, there is less awareness of developmental dyscalculia in the general population and it has long been an underresearched neurodevelopmental disorder. 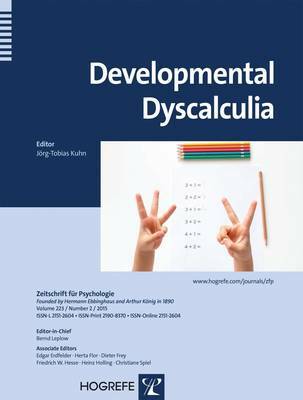 This volume aims to further our understanding of developmental dyscalculia and measures that might help to redress it.In addition to recent research findings highlighting the importance of working memory facets in developmental dyscalculia and investigating the IQ-achievement discrepancy criterion in defining the disorder, a meta-analysis on the effectiveness of interventions for children with mathematical difficulties provides new directions for how affected children can best be helped.